There in the above picture is a group of young men and women, a bath tub full of coins, and one very, very unhappy store clerk. Yes, the picture says it all. According to a post by Facebook user Ludmila Semushina, an Apple fan brought a bath tub filled with coins to an Apple store to purchase an iPhone XS. 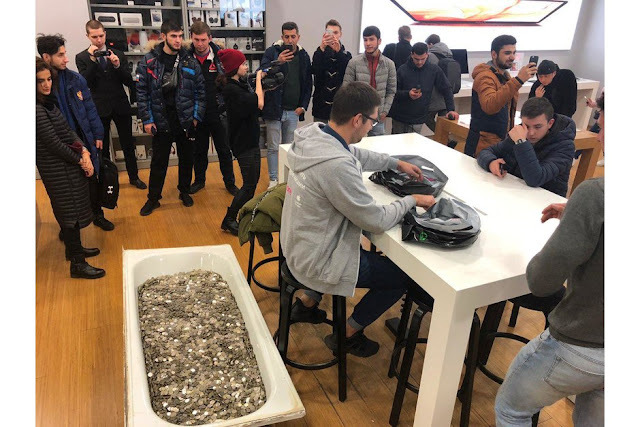 The bath tub had approximately 100,000 Russian rubles, which amounts to more than $1,400 US dollars which is the price for the iPhone XS with 256 storage capacity. From the picture, you can see two men sitting on a table. The one unveiling a package is the customer who just bought the iPhone XS, while the gloomy looking guy is the store clerk. Oh, least i forget. I know you might be wondering who those bystanders taking pictures and videos of the event. Well, the bath tub was so heavy that it required as many much people to move it to the store. We wonder how many days it took, or it will take the store clerk to count those coins. Congrats to the buyer on his new iPhone and for pulling such stunt.